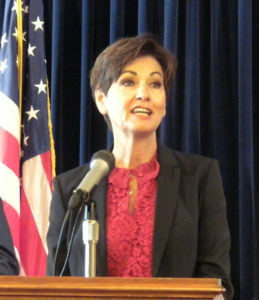 During the late stages of the 2018 campaign, Republican Governor Kim Reynolds proposed letting Iowa women buy “the pill” without a prescription. She plans to press the 2019 legislature to pass a bill that would make birth control pills available in Iowa without a doctor’s prescription. “This is another opportunity for us to have bipartisan support in something that makes sense,” Reynolds said yesterday. In 2016, Democrats in the Iowa Senate passed a bill to make this the policy in Iowa, but Republicans in the House tabled the proposal. Republican House Speaker Linda Upmeyer of Clear Lake said not all birth control pills are alike and legislators will have to seek input from the medical community. Democrats strongly criticized Reynolds for signing a bill last May to ban nearly all abortions and Senate Democratic Leader Janet Petersen of Des Moines said they are skeptical of this proposal, too. Petersen said many women want more effective long-term contraceptives rather than birth control pills and the Republican effort to “defund” Planned Parenthood clinics has reduced access to those long-term options, especially in rural areas. The outline Governor Reynolds sketched during the campaign called for keeping birth control pills behind the pharmacy counter, but letting women buy them without a prescription. Her proposal did not cover other birth control options.